The brunette beauty - who wed Prince William in April - told guests at a recent gala dinner how she was incredibly happy since tying the knot in April even though she sometimes finds her new royal role "surreal". One guest at the exclusive bash at London's Kensington Palace told the Daily Mirror newspaper: "Kate said she was 'loving it' when asked what married life was like. She added that it was surreal sometimes but that's to be expected. "She said she was totally and blissfully happy and her eyes lit up whenever William's name was mentioned. The pair are clearly so in love." Catherine was making her first official public appearance with William at the 10th annual Absolute Return for Kids (ARK) Gala Dinner on Thursday (09.06.11) and while the bash was completely over-the-top, onlookers say the couple didn't seem to mind. The onlooker added: "It was the most extravagant, ostentatious, over-the-top bash you can ever imagine with bankers splashing their cash like there's no tomorrow. It was not the sort of occasion you would normally associate with royalty. 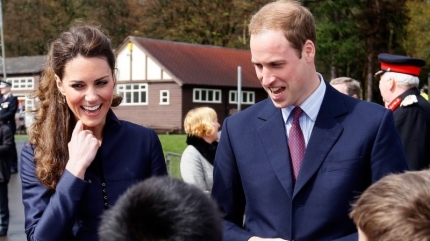 But Kate and Wills took it in their stride like true professionals." Earlier in the evening, William addressed the crowd to announce his wife had joined the Foundation of Prince William and Prince Harry as a patron. He said: "My brother, Catherine and I hope to use our philanthropy as a long-term catalyst for meaningful change."